In this on-demand webcast, learn why proactive policies and new e-discovery technology are the best ways to manage FOIA requests. The Freedom of Information Act (FOIA) is a pain. A lingering sharp pain that just keeps on getting worse with time. With millions of documents to search through, review and redact, along with an ever expanding amount of FOIA requests to respond to and continuing demands for reform at the Federal and State levels, you know your current process and technology isn't going to make this FOIA request pain any better. In this on-demand webcast, learn from fellow government employees and an expert consultant why the need for proactive policies and new e-discovery technology is the only way to effectively manage FOIA requests. 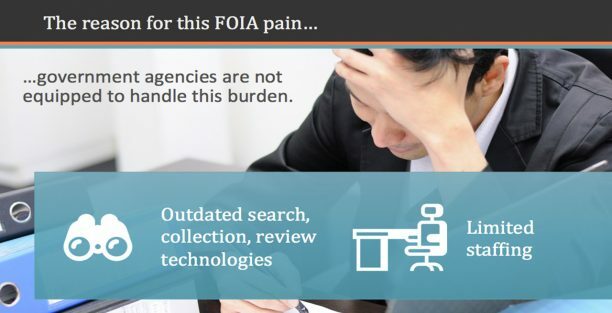 Tips from fellow government peers on how they are solving their FOIA request pains"